Some 20 million die from colliding with cars each year on their way to Mexico, researchers say. Life is hard for the modern American butterfly. Monarch butterflies are declining in North America, and scientists are scrambling to uncover why they are disappearing during their thousands of miles of migration. In an analysis this week in Science, researchers analyze the threats to the butterfly’s survival. They conclude that the problem lies in the dangers of migration. Each year the butterflies spend the winter in Mexico, and then in the spring travel north thousands of miles through the United States and Canada, and back again in the fall. But it’s not individual butterflies that make the journey. It’s a multigenerational relay race, and it’s fraught with danger. The authors find that the greatest declines for monarchs may be occurring during their winters in Mexico and the following migration north to Texas and the Gulf States. 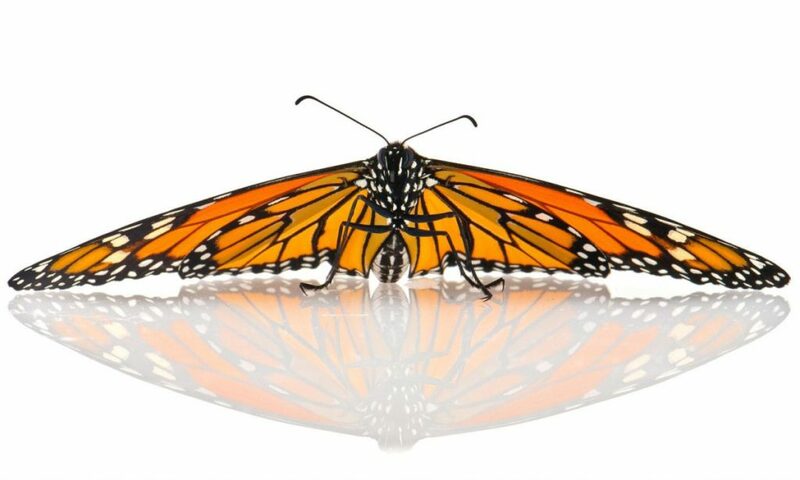 Migration mortality, as it’s called, is creating a disconnect between the large numbers of monarchs produced in the United States and Canada and the smaller numbers reported out of Mexico. “The migration itself might be the problem,” said Anurag Agrawal, James Perkins Professor of Environmental Studies at Cornell University and lead author of the paper. In past 25 years, Mexican forests where the monarchs live have seen a steep decline. But the butterflies face many struggles during the long international journey. “Twenty million monarchs die in car accidents every year on their way to Mexico,” said Agrawal. Freeways and cities across the United States bisect the butterfly habitat and reduce the areas of appropriate pit stops. In addition, habitat loss, pollution, pesticides and climate change are threatening the insect. When resting between trips, monarchs are a mosaic of orange and black, often appearing so thickly in trees that they appear to be a cloud of gently blinking leaves. The monarchs can be so dense that scientists and volunteer citizen scientists count them per hectare, the area of land they cover, rather than individually. Monitoring monarch migrations is a huge effort involving three countries, over 3,000 miles, and uncounted citizen scientists, along with large organizations such as World Wildlife Fund and U.S. Fish and Wildlife, and a lot of butterfly researchers. Migration is more than a winged spectacle, it’s also a feat of navigation and biology. How do they find their way during this long and complicated migration? Monarch hearing and their internal GPS, or “sun compass,” are areas of active research. Andy Davis, Assistant Research Scientist of the University of Georgia, examines the insects’ stress responses by gently placing chubby striped caterpillars under a small sensor that lets him and his team watch the bug’s tiny tubular heart beat. “You can get it similar to the heart rate monitor at the hospital, you know: Beep. Beep. Beep. Beep,” said Davis. Then he plays the sounds of highway traffic. He and his colleagues found that, not unlike humans, caterpillars are distressed by short bursts of traffic noise. However, after long periods of chronic noise, the caterpillars became accustomed or desensitized. It’s not yet clear what this means for the butterfly’s long-distance migration, but the research, published last month in Biology Letters, could be a piece of the puzzle of their decline. Monarchs migrate in multiple generations. An egg laid in the Midwest will hatch into a tiny worm small enough to curl up comfortably on the m of an M&M candy. It will grow, voraciously munching milkweed for a few weeks, before transforming into a butterfly. This butterfly will then travel a little farther south, lay more eggs and die after living for only a month. That butterfly’s daughter, however, could be in the overwintering generation that makes it to Mexico, and instead of living just one month, the daughter butterfly could live eight months. Agrawal explains that this long-lived butterfly generation is different: They do not lay eggs or eat milkweed in the winter; they sun and drink nectar in Mexico. After what seems like a long vacation, they fly north to Gulf States like Texas to breed and die. These next generations will go back to being short-lived and continue their generational steppingstone migration north. “Having that final generation live three times longer than your parent, if we think about that in humans, that’s pretty wild,” said Hidetoshi Inamine, a postdoctoral researcher at Pennsylvania State University and an author of the Science study. Decline of milkweed in recent years is well documented and another major cause for concern about the monarch’s decline. One of the challenges during migration through the Midwest and Northeast includes finding suitable habitat that includes the milkweed plant. According to Alfonso Alonso from the Smithsonian Conservation Biology Institute, increased use of Round Up pesticides in the early 2000s caused a severe decline in milkweed. Monarch caterpillars rely solely on this plant for food and shelter. Scientists, conservationists and concerned citizens are working to determine how best to restore the monarch to its previous glory. Inamine has milkweed in his Pennsylvania backyard, so he can watch the monarchs. For now, it can’t hurt to plant more milkweed, but it’s important to plant ones native to the local area. Nonnative milkweeds have been linked to diseases and mortality in the monarchs as they continue their journey. Monarch lives are complicated by battles with a changing planet across thousands of miles of travel each year. The butterflies are a widespread pollinator. They are an important part of the American landscape with vital connections to Canada and Mexico. Planting milkweed, reducing pesticide use and mitigating climate change are prime ways to aid the monarch. Understanding this burnt orange insect would be impossible without international collaboration and cross-border connections, and all scientists interviewed were united in their passion for the butterfly and the will to protect it.